“In the Aisles” is being presented at the 2018 Milwaukee Film Festival. It will again be shown at 12:30 p.m. Saturday, Oct. 27 at Fox-Bay Cinema Grill. SHE: ‘In the Aisles,” a German film with English subtitles, is touted as being in the same vein as the popular American TV series “The Office.” While there were a few laughs in the show, the film touches on some serious topics including domestic abuse, alcoholism, closeted homosexuality, loneliness and suicide. HE: It didn’t have me rolling in the aisles (get the pun? ), that’s for sure. It moved rather glacially. I wasn’t sorry to see it end, actually, but was sorry that the three main characters didn’t enjoy a happier lot. My two favorite performers were Sandra Huller—I remembered her, positively, from “Toni Erdmann” (a much more enjoyable German film) a year or two ago, and Peter Kurth as a droll, stoic and heartsick supermarket supervisor named Bruno. Huller plays main character Christian’s (Franz Rogowski, also a convincing performer) love interest, or prospective love interest. SHE: “In the Aisles” takes place is a warehouse megamarket in Germany. A shy, new employee, Christian, is assigned to stock the aisles of the beverage section, where he needs to learn to use a forklift. He works the night shift, where the crew listens to classical music preceded by the proclamation from the boss, “Now is the time for the tough guys.” He befriends Bruno, his immediate supervisor, who we learn has a secret, and becomes infatuated with the pretty girl in the sweets section, Marion (Huller), as he tries to forge a new future from his misguided past. HE: That “girl” is, in reality, 40 years old. Rogowski’s character is in his early 30s. The age difference, I think, is apparent; the budding relationship might’ve been a tad more convincing with a younger Marion—or an older Christian. SHE: I liked the look and feel of this film – the dark, shadowy aisles of the store, the classical music (such as “The Blue Danube,” and “Lo, How a Rose” in German played in the store during the holidays), the intense sounds, including that of rushing waves at times. I also liked the subtleties, like the many times Christian would pull on the cuffs and collar of his work jacket to cover his tattoos. HE: That cuff-pulling became a motif, I guess to emphasize his embarrassment regarding his past life. 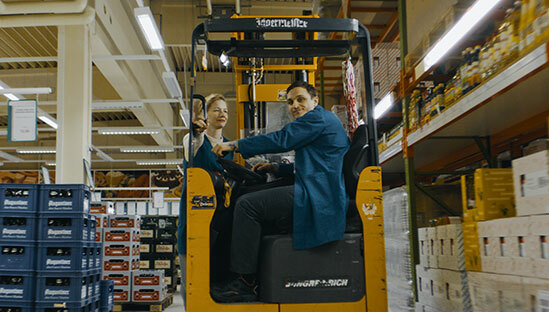 SHE: There are some funny moments, like when Christian is learning to use the forklift and Bruno tells him, “You’re forklifting like a lunatic because you’re in love.” Yet, the film is often dark and brooding, over-shadowing the sweet budding relationship between Marion and Christian. The acting is marvelous, but the movie has a heavy feel, especially considering the fact it was supposed to be light. HE: I’d give it a B-. You? SHE: I’d give it the same.